There’s still time to see the compact but thoroughly enjoyable exhibition Propaganda and War: The Allied Front during the First World War at the RCAC. 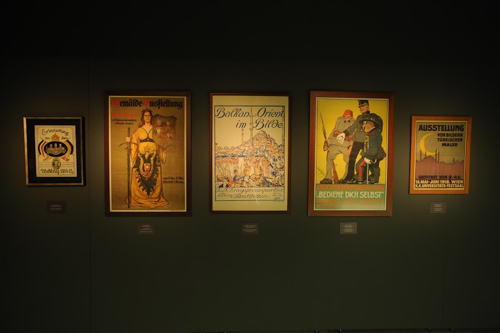 Organised within the scope of the 100th anniversary of the First World War, historical objects, archival documents and Ottoman artefacts and memorabilia from the Ömer M Koç Collection paint a picture of how the four-year war required the power of propaganda to establish and foster a sense of ‘Brothers in Arms’ between the Alliance countries. Curated by Bahattin Öztuncay and designed by Yeşim Demir, the show is wonderfully lit and laid out. 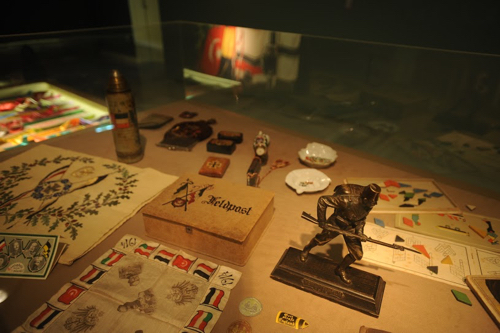 The selection of medals, aid badges, posters, postcards, china, glassware, banners and flags, with the crescent and star symbolising the Ottoman Empire, on display once adorned the streets of Berlin and Vienna – places where in the years just preceding the war these very the symbols of the threat of siege. The Ottoman Empire’s alliance with Germany, the Austro-Hungarian Empire and Bulgaria meant that side-by-side portraits of these regions’ respective leaders – Sultan Mehmed V, Emperor Wilhelm II, Franz Joseph I and King Ferdinand I – were ingrained into the social consciousness in cities across the empires. 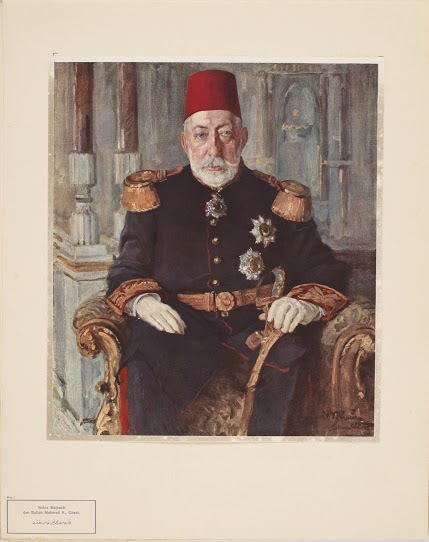 The above shows a rare album plate of Mehmed V by Wilhelm Viktor Krausz, one of the most prolific war artists, who depicted various leaders and military commanders between 1915 and 1916. The volume it is from also contains the first known portrait of Mustafa Kemal Atatürk. Photographs and colourful designs symbolising the ‘Alliance’ were pervasive in newspapers, books and on billboards. 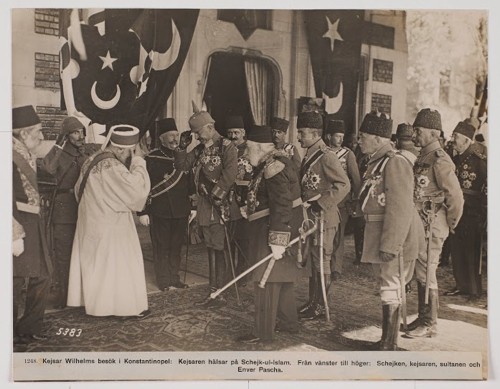 Above is one such photograph that would have saturated the press at the time: it shows a meeting between Wilhelm II and Mehmed V, with Shaykh ul-Islam Hayri Efendi and the Minister of War Enver Pasha looking on. Colour lithograph posters were also widespread. 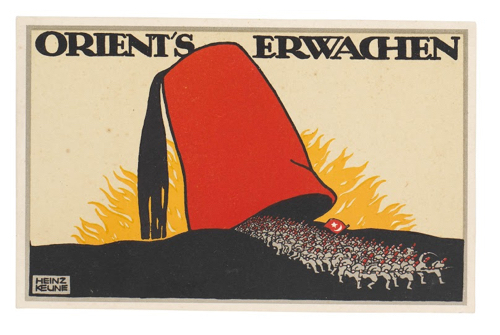 The above image shows five such posters, with the one in the middle ‘The Balkans and the Orient in Pictures’ designed by another war artist, Oskar Laske, in 1918. But ‘perhaps the most remarkable’ among the print mediums, and ‘also the cheapest but most expressive, were postcards’. 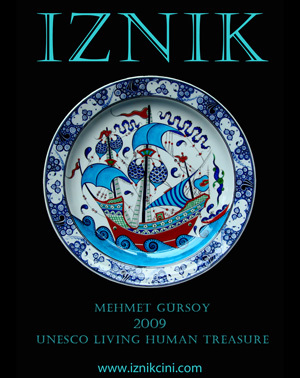 ‘Medals of the poor, they were printed in Germany, Austria and occasionally in the Ottoman Empire, and occupied a colourful and shifting space of communication that could move across borders with much greater ease than crockery or even medals,’ says the accompanying catalogue (available from the Cornucopia store). 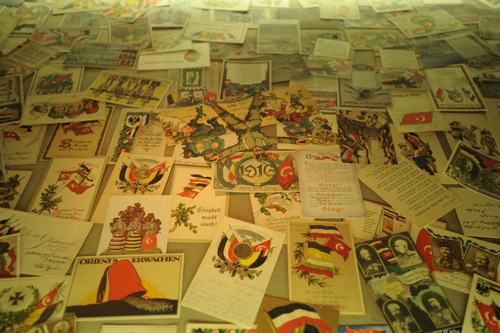 The above shows a case of the postcards on display (top) and a close-up of a Triple and Quadruple Alliance propaganda postcard (bottom). 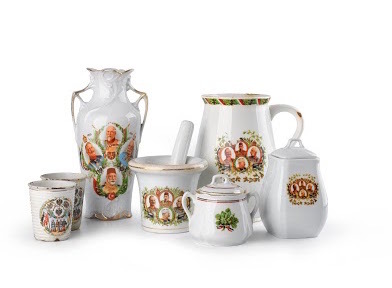 Porcelain goods and decorative objects were made as Alliance souvenirs. Fine coffee cups, vases and plates like in the photo above (again often featuring the faces of the Alliance members’ leaders) were designed to publicise and glorify anything related to the Alliance countries’ military and political struggle against the Entente. To German and Austrian families of this period they would have been a part of everyday life. The above image shows a selection of alliance commemorative medals. ‘The Ottoman War Medal could be understood as a very successful graphic translation of the German Iron Cross. The Ottomans did not go as far as calling their medal the Iron Star (Demir Yıldız), but the Germans did so in their stead: [they colloquially called] the Ottoman War Medal Eiserner Halbmond or Iron Crescent,’ the catalogue says. A significant number of objects that show children juxtaposed with war quotes produced the most blatant form of propaganda. The most interesting pieces from this section are puzzles and toys (seen in the image above). Featuring Alliance motifs and illustrations of soldiers and civilians, they depicted a playful approach to a tragic event. 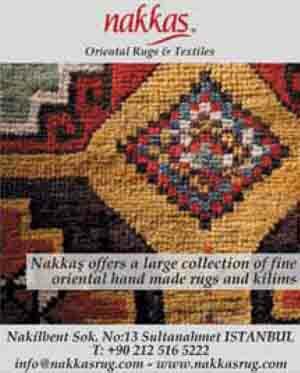 The exhibition continues until April 2, 2015.